How often do you use FolderContext? In our post v5: Streamlined & Smarter we mentioned that we plan to limit the display of FolderContext to Project Dashboards, removing it from individual folders. Given recent feedback, we’d like to know how you use FolderContext. Please take the poll below and post any additional comments you would like to share. Thanks! Thanks for Signing Up for the Beta! If you haven’t already signed up for the v5 beta, send an email to beta at clearcontext dot com. Turn off new mail notifications via Do Not Disturb so that you can work on your tasks without interruption. Open the ClearContext Dashboard and select a project to work on via the Topic drop down. Work on your most important tasks for the project. To stay on top of email throughout the day, sort your Inbox by priority (ClearContext > Inbox Views) and review only your highest priority messages (in red and blue) as needed. Use the MessageContext to see emails, appointments and other related tasks to get the full context for the item you are working on. One note on the Prioritized step above – if you look at a message during this phase, make sure that you act on any message you open just as you would in the manage phase. You should strive to only touch an Inbox message once. By completing the Identify and Manage steps previously, you are free to focus on the work that is most important to you while staying in control of your email. Posted by brad at 10:25 am on September 11th, 2009. If the message doesn't have a Topic assigned to it, assign one. IMS will link all future emails, tasks and appointments to this Topic. Reply to the message if you can do so in a minute or two. IMS can automatically file the original message to a Topic folder for you. Delegate the email to someone else as appropriate. If no response is required, review the message and file it to a Topic folder. Defer messages that you aren't ready to deal with to a later date. Create a task from email that requires further action on your part. Schedule appointments from messages that require a meeting. Unsubscribe from mailing lists or long email threads that you have no interest in. Delete messages that you don't need to keep for archiving purposes. This phase is the bridge that moves you from sizing up your day to working on your most important projects. Consider it blocking and tackling – quickly and efficiently move through your Inbox and put messages onto your calendar or your task list. The end result will be a cleared Inbox and a prioritized task list, allowing you to focus on your work rather than your email. Posted by brad at 8:21 am on September 10th, 2009.
Review today's meetings and appointments. Reschedule any conflicts. Review your Tasks and Actions list for the day. Adjust due dates based on task and project priorities. Review your Alerts to see which messages demand immediate attention. 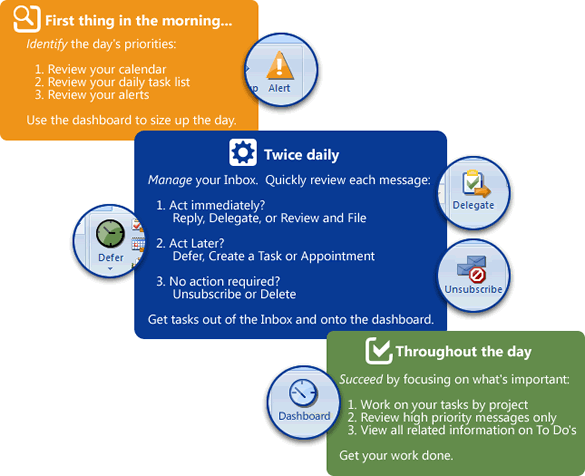 Identify your highest priority messages so that you are prepared to manage your Inbox. Taking this time in the morning to get your priorities in place is the key to a productive day. Before you move on to manage your Inbox for the first time, work on one or two of your most important tasks. Posted by brad at 10:15 am on September 9th, 2009. Over the next few days, we will review each step in more detail. Posted by brad at 2:11 pm on September 8th, 2009. Use AutoAssign to quickly file newsletters and other informational messages. Prioritize your inbox and delete or file unwanted\low priority messages. Manage your inbox, spending a minute or two on each conversation. Delete, Reply, File, Defer, Unsubscribe or create a Task or Appointment and quickly move on. For more detailed inbox triage tips, see Vacation Email Triage. Posted by brad at 9:55 am on September 4th, 2009. Yesterday’s Gmail outage exposed the #1 reason to use desktop email clients over webmail. Jim Kissell at MacWorld has written six OTHER reasons that desktop email clients are superior to webmail clients, including better integration with other apps, attachment management and rule creation. Read the article here. Posted by brad at 11:23 am on September 3rd, 2009. Our new Facebook page is up and running. Become a fan here. We’re also on twitter. Follow here. Finally, subscribe to our corporate blog for product updates, email tips and more. Posted by brad at 8:54 am on September 2nd, 2009.